Last September, I complained of not being able to find the source of an oft-quoted comment by T.S. Eliot, who remarked that Reed's poem, "Chard Whitlow," was the only parody deserving of its success. 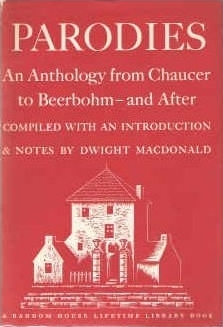 Realizing that I have been less than devoted to updating here, and that I have been stockpiling items worthy of posting, let us begin at the top of the pile: Dwight Macdonald's (Wikipedia) Parodies: An Anthology from Chaucer to Beerbohmand After (WorldCat). This famous parody was originally an entry in a New Statesman contest. 'Most parodies of one's own work strike one as very poor,' Mr. Eliot writes. 'In fact one is apt to think one could parody oneself much better. (As a matter of fact some critics have said that I have done so.) But there is one which deserves the success it has had, Henry Reed's Chard Whitlow.' Broadness is the sin of most Eliot parodies; Mr. Reed's alone seems to me to escape it. The one following, by 'Myra Buttle,' who is a Cambridge don, does not. I have included it because it is funny and because I thought some sample of The Sweeniad should be given. Alas, Mr. Macdonald does not credit or cite the source of his 'Mr. Eliot writes'. As an editor of The Partisan Review, he did have reason to correspond with Eliot, and letters from Eliot in Macdonald's papers do appear from the right time period: 1959-1960 (see the "Guide to the Dwight Macdonald Papers," 230 page .pdf, from the Manuscripts and Archives department at Yale University Library). Macdonald is careful to include permissions for using other quoted material in his text, but none is provided for Eliot. Did he write Eliot and ask the poet's opinion of his parodists? Is Eliot's letter residing in some box at Yale?